Massage chairs have gone through a lot of changes throughout the years. An early shiatsu massage chair consisted of a roller that moves up and down the spine. Since that time, leg massage, arm massage, shoulder massage and a customized back massage have been added to shiatsu massage chairs. The most state of the art chairs available today developed their back massage by mimicking the motion of massage therapist’s hands on a human torso. They scan each users back and custom form a massage with soft tipped quad rollers. While massage chairs mimic a massage therapists motion a real human massage is always best. The reason is that massage chairs don’t cover the front of humans and cannot get the tops of the shoulders as well as a real human massage therapist. Massage chairs can be an excellent tool in between massage therapy sessions, but if you are using one for an injury you should consult your doctor first. A good massage chair is build on a solid steel frame. The material that should be used is synthetic leather because real leather does not retain its shape and tends to sag after time. The shiatsu massage chairs available today also often incorporate air massage to touch on delicate places and places the rollers cannot reach like the calves and hands. Some foot massages incorporate rollers while other massage chairs use air to massage feet. Most contemporary massage chairs are remote controlled while some implement voice control. 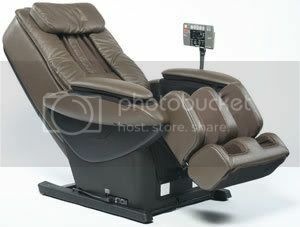 Below is one of the massage chairs called PHP-2030 Massage Chair.